This is the US Dollar Index, introduced in 1973 as an analytical tool. It used to gauge the performance of the US Dollar against a basket of the top 6 floating currencies in the forex market. The USDX is defined as a weighted geometric. That mean of the value of the US Dollar when it is compared with the basket of 6 currencies. The USDX came into existence in March 1973 when it was created by the US Federal Reserve as a way of estimating the value of the US Dollar against other countries. Since the old exchange rate system created in 1944 under the Bretton-Woods agreement had been abandoned in 1971. The collapse of dollar-gold peg of 1944 had led to the floating of the world’s major currencies. This meant that in evaluating the value of the US Dollar to other currencies, a system of doing so had to be introduced. This is what led to the creation of the USDX with a base value of 100.00. Lower values suggest that the USDX has fallen below its 1973 base, and values higher than 100 suggest that the USDX has increased beyond its 1973 base. This composition of the US Dollar Index was changed in 1999 with the introduction of the Euro, and the Euro was then incorporated into the basket to replace other currencies like the Deutsche Mark, French Franc, etc. As we can see, the Euro has the greatest weight since the EURUSD currency pair is the most traded in the forex market. In addition, the replacement of several currencies of European origin in the basket is also reflected in the increased weighting of the Euro over other currency pairs in the basket. Why is the USDX important? Now many traders reading this may ask: what is the relevance of the USDX to their trading activity? 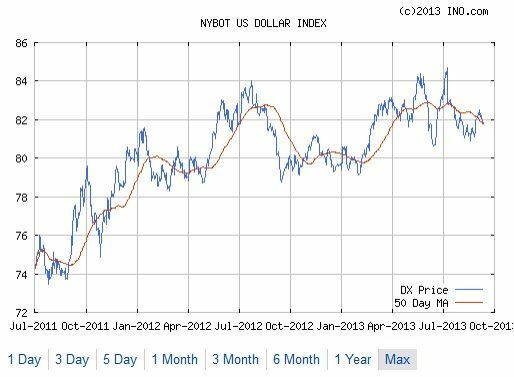 Why is it important to even know a thing about the US Dollar Index? As we shall see very shortly, the USDX is a very valuable analytical tool for any trader who is trading the forex, bond or commodities markets. When we consider that the financial markets are all inter-related, it means that certain trading decisions can be made on the effect of the USDX on an asset such as gold or a certain currency. The US Dollar Index is updated at the start of a new US trading session every day, using information obtained from the currency market. The US Dollar index has an inverse correlation with the EURUSD. As can be expected, the heavy weighting in favour of the Euro means that the EURUSD would be the currency pair most affected by changes in the value of the US Dollar Index. A rise in the USDX means that there will be a corresponding fall in the value of the EURUSD. Thus the USDX can be used to make trading decisions on the EURUSD, which is very valuable to forex traders. The USDX also shares an inverse relationship with the price of gold. Do not forget that gold is actually listed as XAU/USD, which is Gold being traded as the base asset and the USD as the counter asset. In a similar manner, silver can also be traded using the US Dollar Index. Silver is listed as XAG/USD, therefore silver bears an inverse relationship with the USDX, falling with increasing values of the USDX and rising when the USDX is falling. So trading decisions on gold and silver can be made using the change in values of the US Dollar Index. Bond yields also have an inverse relationship with the USDX. Why in the world would a forex trader care about this information? The reason is this. When bond prices are going down, bond yields are going to go up. Rising bond prices will keep bond yields down. Bond yields give a good indication of the situation in the stock market. Falling stock prices usually chase away investors from the stock market and into the bond market, driving up demand for bonds and increasing bond prices, which keeps yields low. Bonds are an example of a USD-backed investment. Investors get into US bonds (Treasuries) to profit from interest rates paid by the Fed Reserve on these bonds, and these are purchased with US Dollars in the US bond market. Therefore, a higher demand for bonds will also lead to a higher demand for the USD (since foreign investors need to buy US Dollars to purchase US bonds). This situation will cause a rise in the USD relative to the currencies in the basket measured by the USDX, and this in turn causes a rise in the USDX. The rise in the USDX can then be used to make investment decisions on the EURUSD, on gold and on silver. The USDX can be traded as a standalone financial instrument just like any other index. Trading on the USDX Index as futures and options contracts commenced in the mid 80s and can be carried out today using a futures trading account. The USDX can also be traded using Exchange Traded Funds that track the performance of this index. One of these funds is the PowerShares DB US Dollar Index Bullish (UUP). The movement of this ETF is directly correlated to the movement of the US Dollar, rising and falling in tandem with the greenback. The second ETF is the PowerShares DB US Dollar Index Bearish (UDN), which is inversely correlated to the US Dollar. The UDN rises with a falling US Dollar, and falls when the US Dollar is rising. Both ETFs are listed on the New York Stock Exchange (NYSE). What impacts the USDX ? Naturally, the next question would be: what impacts the USDX sufficiently enough for it to be used to make money in the financial markets? Any news of high market impact such as the US Non-Farm Payroll + Unemployment rate report, Interest rate decisions, retail sales, GDP reports or other actions by the Federal Reserve that affect monetary policy (such as quantitative easing) will all have an impact on the US Dollar Index. Factors that strengthen the US Dollar will also cause an increase in the value of the US Dollar Index. In the same vein, factors that are USD-negative will decrease the value of the USDX. It also follows that any factors that are Euro-positive will adversely affect the US Dollar Index, while Euro-negative influences are good for the USDX. The composition of the basket which is highly in favour of the Euro means that the influence of the other currencies and their impacting factors are negligible and not useful in either trading the US Dollar Index itself or making trade decisions based on the USDX. Access to USDX charts can be via www.ino.com or other related sites.